CARACAS/WASHINGTON, May 21 (Reuters) - Critics at home and abroad on Monday denounced the vote that re-elected Venezuela’s socialist President Nicolas Maduro as a farce cementing autocracy and the U.S. government imposed new sanctions on the crisis-stricken oil-producing country. The 55-year-old successor to late leftist leader Hugo Chavez hailed his win in Sunday’s election as a victory against “imperialism.” But his main challengers alleged irregularities and refused to recognize the result. The vote was widely condemned overseas. U.S. President Donald Trump issued an executive order restricting Venezuela’s ability to liquidate state assets and debt in the United States, an action that appeared to target in part Venezuelan-owned but U.S.-based oil refiner Citgo. Venezuela’s mainstream opposition boycotted the vote, given that two of its most popular leaders were barred, authorities had banned the coalition and several of its parties, and the election board is run by Maduro loyalists. 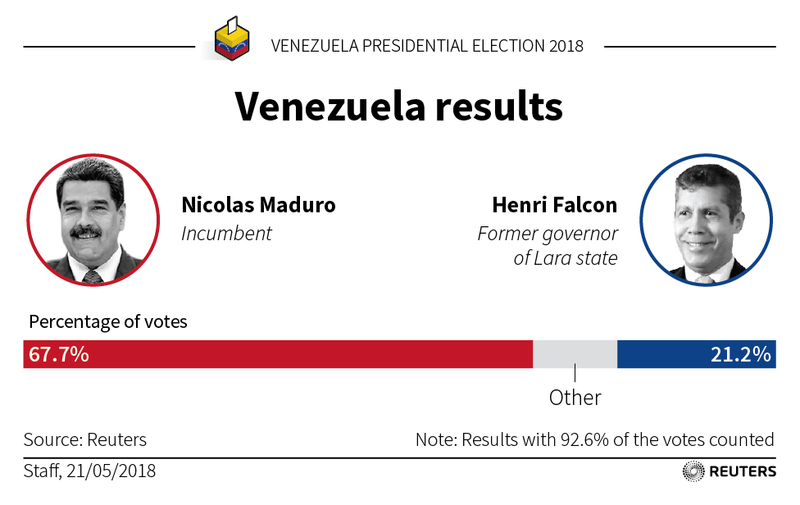 Maduro won 68 percent of votes - more than three times as many as his main rival Henri Falcon. Turnout was a low 46 percent, compared with 80 percent at the last presidential election in 2013. “The revolution is here to stay!” Maduro told supporters outside the presidential palace in Caracas. He promised to prioritize economic recovery after five years of crippling recession that has seen many in the OPEC nation of 30 million people struggle with chronic shortages of food, medicines and other basic necessities. “We mustn’t cave to any empire, or go running to the International Monetary Fund as Argentina did,” said government supporter Ingrid Sequera, 51. She wore a T-shirt with a logo featuring the eyes of Maduro’s mentor, Chavez. U.S. crude hit its highest level since 2014 on Monday amid rising concerns that Venezuela’s oil output could fall further following the election and the country could be hit with more sanctions. U.S. Vice President Mike Pence called the election “a sham - neither free nor fair.” The Maduro government had manipulated the election and was using hunger as a weapon, U.S. officials told reporters of the decision to impose further sanctions. In recent months, Washington has imposed a series of sanctions on companies and individuals with ties to the Maduro government. “Today’s executive order closes another avenue for corruption that we have observed being used: it denies corrupt Venezuelan officials the ability to improperly value and sell off public assets in return for kickbacks,” a senior administration official told reporters in Washington. Venezuela’s Information Ministry and state oil company PDVSA did not immediately respond to a request for comment. Other countries also hinted at sanctions, with Spain leading European Union criticism of the election. “Venezuela’s electoral process has not respected the most basic democratic standards. Spain and its European partners will study appropriate measures,” tweeted Prime Minister Mariano Rajoy. The 14-nation “Lima Group” of countries in the Americas, from Canada to Brazil, said in a stinging statement it did not recognize the vote and would downgrade diplomatic relations. The group deplored Venezuela’s “grave humanitarian situation” behind a migrant exodus. In contrast, regional leftist allies of Venezuela, such as Cuba and Bolivia, sent their congratulations. Maduro can also count on the support of China and Russia, which have provided billions of dollars in funding in recent years. In Beijing, foreign ministry spokesman Lu Kang said China believed Venezuela’s government and people could handle their own affairs and the choice of the people should be respected. The U.S. official said on Monday that the Trump administration had had “fairly pointed discussions” with China and Russia over the issuing of new credit to Venezuela. The Venezuelan government used ample state resources to get voters out on Sunday and public workers were pressured to vote. Falcon called for a new vote, complaining about the government’s placing of nearly 13,000 pro-government stands called “red spots” close to polling stations nationwide. The often divided opposition coalition appeared more united after the election and said its boycott had worked. “The fraud has been exposed and today the world will reject it,” tweeted opposition leader Julio Borges. It was not clear what strategy the opposition would now adopt, but major protests seemed unlikely given widespread disillusionment and fatigue. Demonstrators did barricade some streets in the southern city of Puerto Ordaz, drawing teargas from National Guard soldiers, witnesses said. In Caracas, opposition leader Maria Corina Machado unveiled a Venezuelan flag in a small street protest where demonstrators sang the national anthem. Maduro, a former bus driver whose second term in office starts in January, faces a colossal task turning around Venezuela’s moribund economy but has offered no specifics on changes to two decades of state-led policies. The bolivar currency is down 99 percent over the past year and inflation is at an annual 14,000 percent, according to the opposition-led National Assembly. Venezuela’s multiple creditors are considering accelerating claims on unpaid foreign debt, while oil major ConocoPhillips has been taking aggressive action in recent weeks against PDVSA, as part of its claim for compensation over a 2007 nationalization of its assets in Venezuela. Trading of Venezuelan government and PDVSA debt was mixed but volumes remained thin in New York on Monday, with election results considered a formality and offering little to change investor viewpoints. The benchmark government bond due 2027 was bid up 0.25 points to 29 cents on the dollar while the benchmark PDVSA 2022 recovered about half of its early losses to trade down 0.65 points in price to 26.851 cents on the dollar , according to Thomson Reuters data. “I would have been surprised if we had seen some move in the market because that would imply that some bondholders were holding out for a positive election result, which was a very remote possibility,” said Gregan Anderson, macroeconomic strategist at Bulltick LLC in Miami. See graphics on the election results here and the background here to the election.